An introduction: I’m a freelance photographer and a fisherman and have been a fan of Saltwater Experience for many years. A couple of years ago I got a call from Tom, inviting me to come down to the Keys to shoot with them as they shot a few episodes. I jumped at the opportunity and we ended up shooting a few days around the bridges and flats near Hawk’s Cay as well as offshore of Duck Key with Into The Blue before heading down to Key West for a little more offshore action. It was a quick baptism into the TV fishing world which is a lot different then my normal fishing photography, and I’m now happy to spend quite a bit of my time traveling and shooting with SE Multimedia shooting their shows with my group of friends, colleagues and fishing buddies. I will be posting periodically here to give you a little different perspective from each day’s shoot. Like most anglers, I was introduced to fishing by my Dad, as he was by his, and I continued the tradition by doing the same with my daughters. 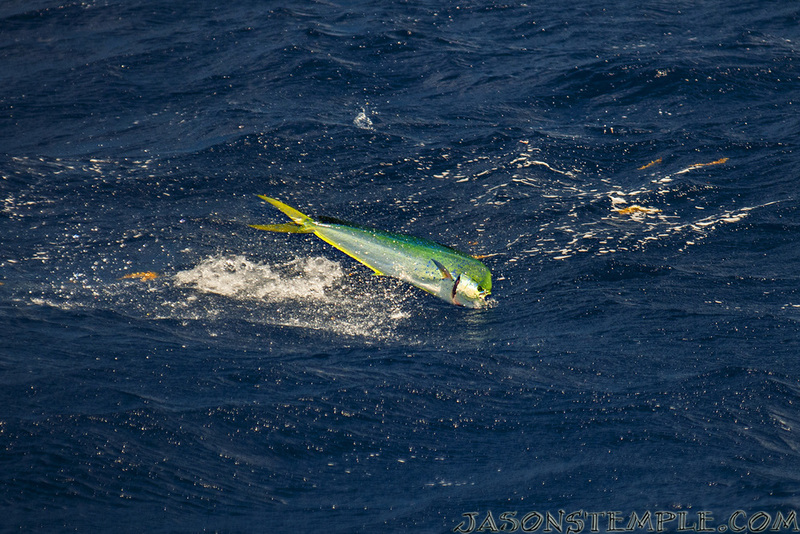 With that in mind, I was excited for a day offshore as we set out to shoot a dolphin show with Rich and his boys. I know Rich has a similar story with his Dad and his boys and I knew I would be fun to be part of that. Of course Tom was along, and was happy to be taking a bit of a backseat on this day as he enjoyed helping and watching the boys fish. In the offshore world, Dolphin might be the prefect fish to take the kids after. 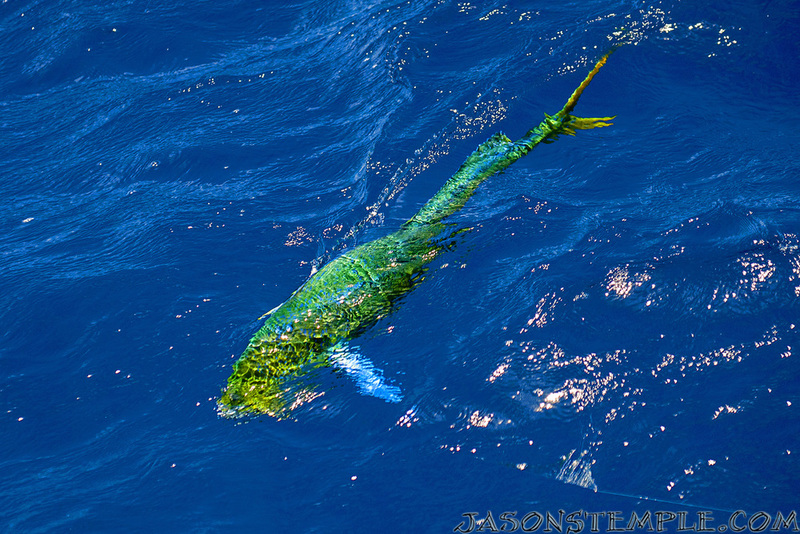 They are an incredibly beautiful fish that you can actually see change colors as they chase down a bait. They can be fished in a number of different ways depending on the age and skill of your anglers, and most importantly, you can count on sustained action once you find some fish. For me, the visual aspect is the best part, and getting the kids to key in on this, actively looking for the birds and the fish and watching the eat keeps them involved and excited. When fishing with kids and/or video crews the days always seem to start near sunrise, but there is a lot of time watching the sun creep higher and higher from the dock as there are a lot of moving parts to get together before we can hit the water. As we had both on this day, it took a little time, but the winds were pretty calm and the dolphin reports had been good, so the crew was pretty relaxed and confident. After everybody was mic’ed up Rich, Tom and the boys loaded into the 32 Yellowfin and the rest of us jumped aboard a brand new 39’ Yellowfin with a tower, we were riding in comfort in the camera boat that day. As we rolled out of Hawk’s Cay we pulled along side for some running shots before we settled in for little ride out to the blue water. In about 500 feet of water there were scattered weeds, flying fish and a few groups of birds here and there. So, they dropped back a couple of ballyhoo and trolled them through where each pod of birds was working. It didn’t take long until the boys were battling some schoolies, at first just a single or double would come to the boat, but eventually they could leave one fighting against the rod holder and the action would continue. Once the action was centered around the boat, they could sight fish to particular fish with spinning rods rigged with ballyhoo or cut bait. After enough schoolie action and more than enough meat in the Yeti, we picked up and headed out deeper in hopes of finding bigger fish. Along the way they stopped to check out a few frigatebirds that were marking a little bit bigger fish but kept working out until they found nice fish in the mid 20lb class. I had a great time shooting from the tower on the 39’, it gave a different perspective offshore and allowed me to see the lit up fish from a long ways out. It was great to watch the boys progress throughout the day, from manning the trolling rods, to pitching baits to individual fish, to gaffing fish and swinging them into the Yeti. Eventually we headed back to the dock and after unloading I got my favorite photos of the day. Rich was fileting the fish and the boys were feeding to skins and carcasses to the tarpon that live under the Tailwalker II. This was obviously not their first time here, and the pure joy of it reminded me of all the little parts that don’t have much to do with catching fish that make the day of fishing with your kids.